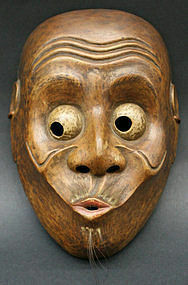 Very Fine and Rare Edo Period Usobuki Kyogen Mask in Excellent Condition. 8h x 5.5w inches, 20.5h x 14w cm. 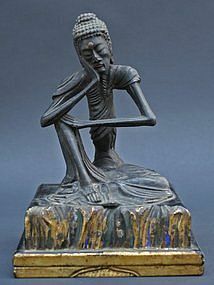 From the collection of Irwin Hersey, renowned author on Asian and primitive art, and publisher of the Primitive Art Newsletter in the 1970s. 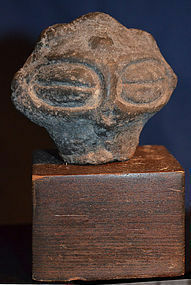 Irwin Hersey was an advisor to museums and prominent collectors, and vetted pieces for many of the international tribal art fairs and Asian art fairs. 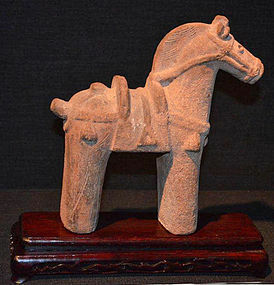 Edo Period (circa 1750) Large Japanese Wood Sculpture of a Shrine Horse, a gift from an upper-class family to a shrine. 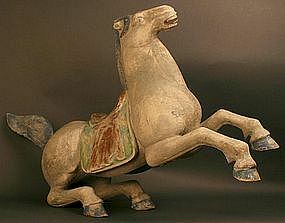 Images of Horses are highly prized in Japan. It is commissioned and presented to protect a newborn male child. Rising up on its back legs, set to gallop, it strikes an animated, exciting, and beautiful pose that sets it apart from the usual static poses that these horses have. 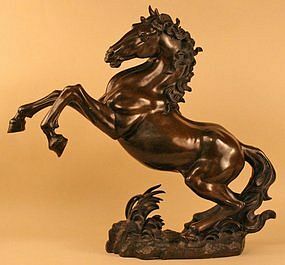 The curves of the sculpture are masterfully rendered to convey the sense of action and spirit in this rare horse. It has a great presence from all angles, and a wonderful color and patina. 25 inches (63.5cm) tall x 38.75 inches (98.5cm) long. From a widely renowned and published collection that has been exhibited at the Metropolitan Museum and Japan Society. 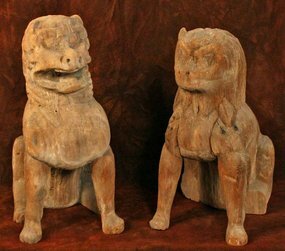 Pair of Carved Wooden Koma Inu Temple Dog Figures, each seated in the traditional posture. 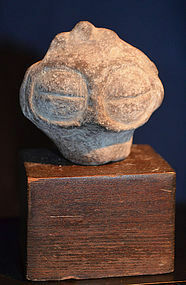 These are a very rare find from the early Heain Period, and could be even earlier, possibly Nara Period. The wood is aged to a beautiful patina. There are not many works of art of the period that come up for sale. There has been some conservation and restoration to stabilize these fantastic and rare pieces. 18.75 and 17.5 inches (47.5 and 44.5 cm) H, 13 and 12 inches (33 and 30.5 cm) W, 10 and 9 inches (25.5 and 23 cm) D.
Edo Period Portable Wood Buddhist Shrine with Exquisite Carving. 17h x 12w inches, 43h x 30.5w cm. In Buddhism, portable shrines were made so that devout travelers with nowhere to worship could carry their shrines with them. The shrines were made with closing doors, to preserve the artwork. 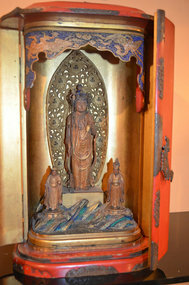 This shrine features exquisitely carved deities and finely lacquered details. 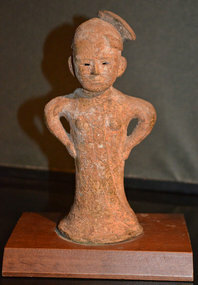 Rare Kamakura Period Sculpture of a of a Nio Guardian King exhibiting power and fierceness. 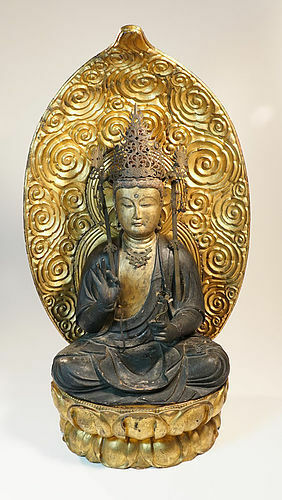 According to Japanese tradition, they traveled with the historical Buddha to protect him. Within the generally pacifist traditions of Buddhism, stories of Niō guardians like Kongōrikishi justified the use of physical force to protect cherished values and beliefs against evil. It is rare to find such an early example. 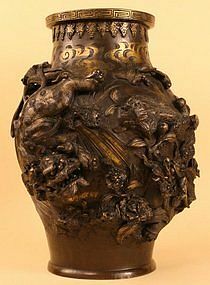 Carved wood and lacquer with some imperfection and losses, as with most works of art surviving the period. 20 inches, 51 cm. 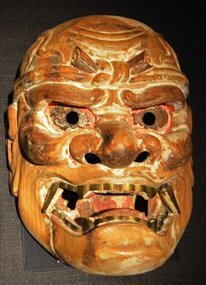 A powerful and extremely rare Japanese Edo Period Kyogen mask of a Nio Guardian King, ferocious native deities, often associated with the Naga Dragon Kings, who converted to Buddhism and now act as bodyguards for the Buddha. The Edo period was the golden age of Noh Drama. Kyogen theater was performed between Noh acts. 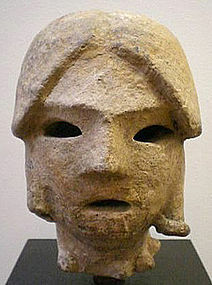 This mask is a brilliantly carved work of art, accentuating the dramatic power of this important mythical figure. 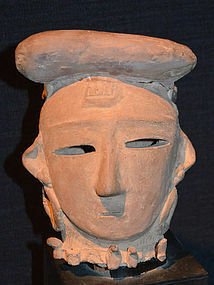 The mask was covered in layered colored gofun (oyster shell lacquer). 9 x 7 inches, 23 x 18 cm.